Despite emerging victorious and reaching the quarter-finals of the World Cup for the first time in their history, England displayed some serious deficiencies in their possession game. The starting formations in England’s 2:1 victory. For the majority of the tie, Mark Sampson’s team were 2nd best in a largely ineffective and dull performance with the ball. England set out in somewhat of a narrow 4-3-3 which was also a 4-1-4-1 situationally. Bardsley started as the goalkeeper behind a back four of Bassett and Houghton flanked by Rafferty on the left and Bronze opposite of her. 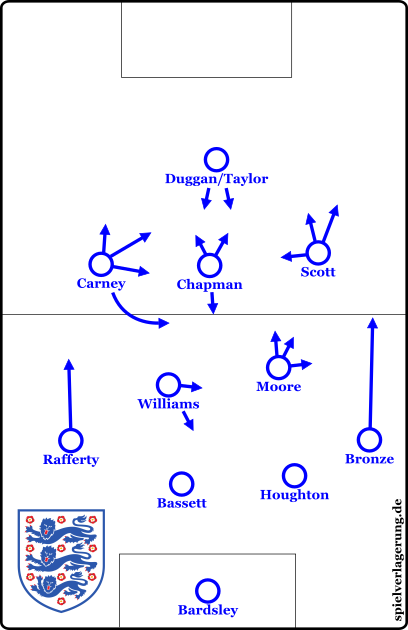 Williams took on her usual position as the pivot at the foot of the midfield triangle with Chapman making vertical movements on the left side whilst Moore was more oriented to the right half-space. Kirby and Carney were given the role of linking attack to defence and were more centrally-positioned in comparison to the ‘standard’ form of a 4-3-3. However they did so quite poorly which gave Duggan little help as she lead the line in attack. In reply, Norway fielded a 4-3-3 formation which took on a quite interesting lopsided shape with Hegerberg occupying an advanced position by Herlovsen whilst Minde took on a deeper role on the right. It took until the 54th minute for Sampson to make a change which to some extent fixed the problems. The team still showed some issues but nowhere near to the extent of their performance prior to the Norway goal as Duggan (and later Taylor) received more support than previously seen throughout the game. 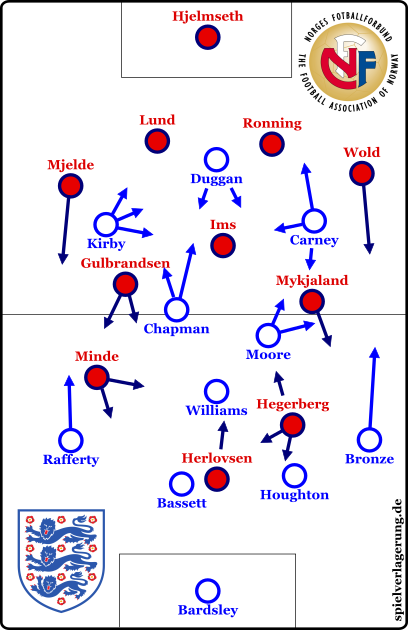 Despite both Kirby and Carney occupying relatively central positions as well as the advancing movements of Chapman, England rarely had access to the centre between the lines of Norway’s defensive block. This caused some serious issues for the team as, without the ability to utilise possession from a central position, they were unable to create any effective attacks during the first 2/3rds of the game. England had to resort to less strategically-beneficial areas to attack from, primarily from the wings and deeper spaces in midfield which resulted in very little threat against the Norway defence. Aside from this there was also a distinct lack of control and general patience in their circulation of the ball which stemmed from their restricted central access as Norway exerted dominance in this area. This issue was not purely a result of England’s inability but Norway obviously had a contributing factor too. They defended in a 4-5-1 shape with a good degree of compactness both horizontally and vertically. This helped weaken the English attacks, especially in the centre of the pitch as the deeper players such as Williams were unable to find the likes of Kirby and Carney particularly in the first 45. For the first 60 minutes of the game, England’s circulation was well below-par. This stemmed from not only the above factor but a lack of strategical intelligence from the players whilst neither the team nor the management seemed to identify a glaringly obvious issue in their passing. As they struggled to move the ball into any areas which could provide a threatening angle, their ball circulation became increasingly direct throughout the game which was extremely ineffective. One of the most notable features in this issue was their distinct lack of ball-orientation which definitely had a role in their direct play as the ball-carrier commonly had little support nearby. The direct play had a major negative impact on the attacking ability of England as the lone striker Duggan was frequently isolated from the rest of the team. Despite the team’s vertical orientation, neither Kirby nor Carney took on positions close to Duggan which suggests a lack of coordination amongst the system. Without players nearby in support, Duggan could rarely develop a structured attack as any possibility was snuffed out almost immediately as she was outnumbered significantly by the physical Norwegian back-line. Bardsley’s distribution from the penalty area typified the issues in England’s approach as the goalkeeper made a long pass at every opportunity and not once was this situation successful. When England did manage to penetrate the Norweigan midfield, they were poor in taking advantage of the rare scenario with a lack of synergy amongst the front 3. One of the most telling issues in their possession game in the final third was their overly-frequent and far too long-ranging attempts at dribbling. This was done mainly by Kirby and ruined any rhythm in the attacks which then became far too individualised and were much more easily defended against. 1. The changing of the ball position creates different situations that must be reacted to by the defence. Through the ball being moved across different spaces at a fast rate, the opposition must be constantly changing aspects such as positioning, mentality and levels of pressure in order to combat this. To do so is very difficult at the pace required and often results in the defenders not being able to keep track of the ball and will become disorganised as a result. 2. The ball is more easily isolated. When defending against an individual looking to dribble through a block, isolating the ball is much more easily achieved as the more extreme numerical superiority for the defending team can close down the space around the ball to a greater extent. Probably the main result of this is the reduced options of the ball-carrier in the situation that they do pass meaning that the defence can orient themselves to react to fewer outcomes which is more effective as a whole as the situational organisation can be better specialised to deal with what is necessary. Albeit more of a simple factor, the idea is that an attack through multiple players offers much more of a threat than an individualised one. Although this is for a plethora of reasons, perhaps key is the polyvalence which a combination offers whilst an individual attack lacks completely. Such an attack offers a threat from multiple perspectives not only due to the changing of situation as mentioned in my first point, but also the incorporation of different players – all of whom possessing unique qualities which would force the defence to adapt somewhat. If the defending team were up against a lone attacker, they can adapt their system quite easily to deal with the tendencies of said forward. This is in contrast to defending versus 3 or 4 players who all offer different approaches to the attack both in a positional sense but on an individual level too – it is in these situations where the defence cannot adapt as easily as each attacker in this group can force a different situation if they receive possession due to their qualities. England’s change of formation after going 1-0 down to a Norway corner. Early in the second half Sampson replaced the disappointing Kirby with Jill Scott and in the subsequent corner, England went 1-0 down. In the grand scheme of things however, the change was ultimately an intelligent one as it was paired with a small shift in formation to a 4-2-3-1 shape. Admittedly, it is difficult to say if the substitution was a like-for-like one tactically and the change in shape was in reaction to the following goal, or that the two were introduced together irregardless of the scoreline. The most obvious impact of the change of shape was the improved support for the striker which was missing for large periods of the game. Although Chapman had been making vertical movements upfield throughout the game she could not impact it to the same extent as she could as more of a true 10 in a positional sense. Despite the fact they still displayed some evidence of the pre-existing issues, England improved to a considerable degree. In particular, their ball-circulation improved as they become much less direct and the movement of the ball was less aimless than that of before the hour mark. Positionally they were more ball-oriented which gave them a better means of developing possession through the team. In addition to this, although they still made similar direct passes into the striker on an occasional basis, they were supported better with Scott and Chapman in particular close by to stop the recipient from being isolated and the attack nullified. Although England’s women made the achievement of reaching the last 8 for the first time in their history, there were some serious issues apparent in their system which must be amended soon. If it were to happen to have effect in this tournament it would most likely have to come in the form of changing some aspects of the system to improve the circulation of the ball and stop the attack from becoming isolated. This could come in the form of a positional change to improve the ball-orientation whilst the change to a 4-2-3-1 supported the striker to somewhat of a greater degree though alternative factors also influenced that. 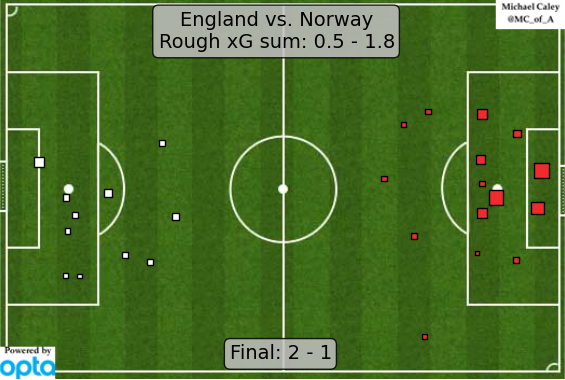 As statistical analyst Michael Caley showed through his xG map, Norway created by far the better chances throughout the game. The eventual losers made 3 shots from very threatening positions, two being from inside the 6 yard box whilst the other in the centre by the penalty spot. In reply, England only had 1 shot of a 1 shot of a similar degree of threat which even then was of less danger to the Norwegian goalkeeper due to the situation it was made in.